A week ago my friends and I dined at Yam's Kitchen along Upper Thomson Road. It's weird how we've never dined there considering it's in the neighbourhood we grew up in. So with all new places I dine at, I entered with zero expectations. Ok that's a lie. How can one have zero expectations when you're paying for a meal? That's just not possible. So let's just say I had expectations but it wasn't through the roof kinda high. If you Google 'Yam's Kitchen', you'd realize they have two restaurants in Singapore and another in Thailand. One at Downtown East, the other here at Jalan Leban and the third at Chaiyapherk Road Nonthaburi in Thailand which is called Bavarian Field. Bavarian Field is primarily a steakhouse that also serves Chinese and Thai fusion dishes in a beautiful setting. I was blown away by photos of Bavarian Field! Have a look yourself by clicking here. I'm so heading there when I'm in Bangkok next! 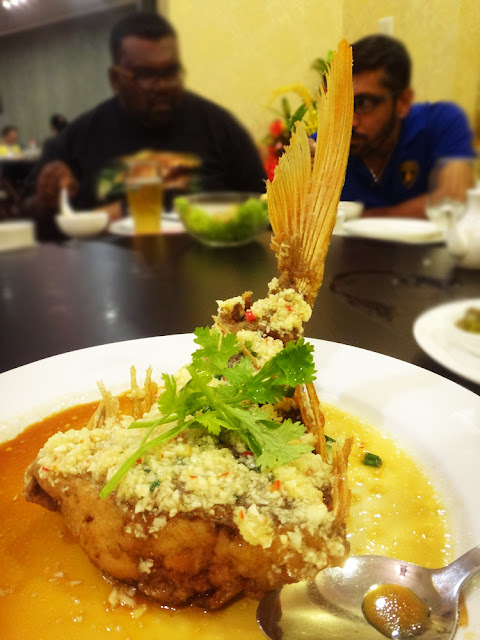 Their signature Salted Egg Fish Skin is to die for, It's crispy, rich in flavour and goes amazingly well with beer. I'm absolutely in love with this dish. I panicked when this dish arrived. My first thoughts were...SHARK FIN SOUP!! Thankfully it isn't. It's Crab Meat Fish Maw Soup. Loved the texture of the crab and fish slices. This dish is highly recommended by Yam's and rightfully so. There was nice crunch to the first bite followed by fish meat that melted in my mouth because it's so fresh. By the way, Yam's uses Red Snapper for this dish. I've never been a fan of Assam so it wouldn't be fair for me to judge this dish. My buddy Jarett went bonkers with this. If I recall correctly, he had three big servings! He loved it! This dish has century eggs, salted eggs and fresh chicken eggs. I didn't think this would be divine but it was! I liked the creamy texture of the soup and the rich flavour with every spoonful. Absolutely yummos! The Marmite Spare Ribs is one of two of my favourite dishes. The ribs were tender and not overcooked. The marmite and sesame seeds added a nice pop of flavour. If I'm not wrong, other than roasted duck, this is the first time I've eaten braised duck. While I can't say I am a fan, I liked how the meat fell of the bone with ease. Don't get me wrong. This dish is tasty but I prefer my duck roasted. What in the world is TWO WAYS HOR FUN?! Well it's hor fun prepared two ways. One half is deep fried and the other is cooked like standard hor fun. What you get is a delightful crunch with every spoon of hor fun. I like! If you can't get enough of deep fried fish skin, you'll be glad to know that they sell them in tubs like these. It's an awesome snack for the home or beer sessions. Talking about beer, Yam's Kitchen serves draft beer at $5.50 per mug and $21.00 per jug. We will definitely dine at Yam's Kitchen again. The service was good and the food was even better. My top three recommendations would be the Salted Egg Fish Skin, Deep Fried Fish Tail with Garlic and Sauce and the Marmite Spare Ribs. Awesome stuff! Do visit their website should you need more information by clicking here. I hope you liked this food review. Till next time, eat well and be happy always!